The Sprints list shows the Sprints that are currently open and the User Stories that belong to each of the Sprints on the list. 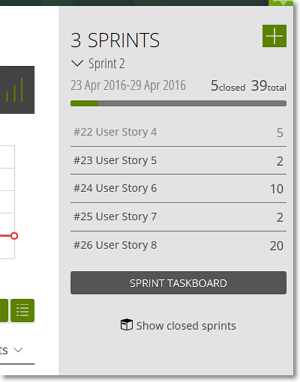 Note: You can drag and drop a User Story of a Sprint to any position on the User Stories list of that Sprint or on the User Stories list of another Sprint. Note: If you have any closed Sprints, scroll to the bottom of the Sprints list and then click Show closed sprints to view the closed Sprints and their User Stories. To edit a Sprint, on the Sprints list, position you pointer over the name of that Sprint and then, on the right side, click – this action opens the Edit Sprint form. Note: The start date of a Sprint determines its position on the Sprints list. After you finish editing, click SAVE to close the form and save any changes made or, in the top-right corner of the page, click to close the form without saving. To delete that Sprint, under the Edit Sprint form, next to Do you want to delete this sprint? – after you confirm, this action removes the Sprint from the list and any User Stories that belong to it are returned to the BACKLOG.